Saving money is no simple task. Between bills, enjoying activities with your kids and those unavoidable expenses that surprise you out of the blue, you may not have much meat left on the bone at the end of the month. Even if you fully understand the importance of stashing away cash for future goals or a rainy day, building a robust savings account is easier said than done. So much so, that some people make mistakes along the way that hinder their progress and keep them from reaching financial success This my explain why a whopping 58% of Americans have less that $1,000 in savings, according to a recent study. 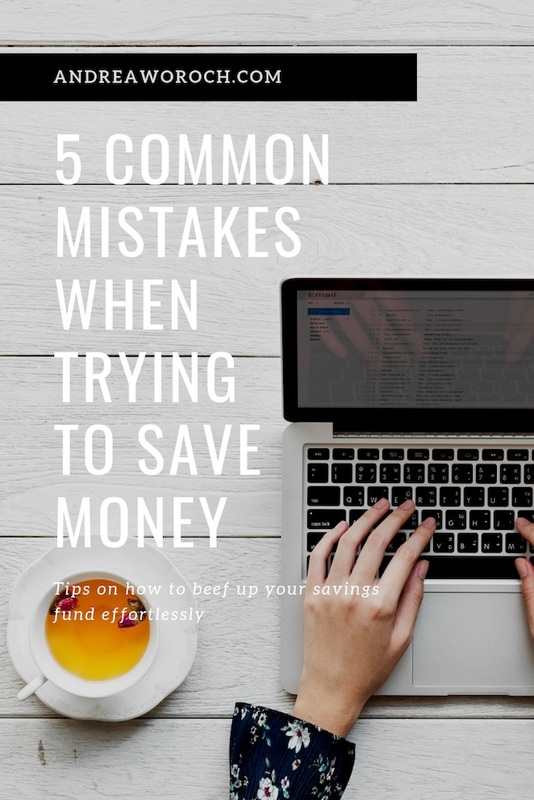 To get your finances moving in the right direction, take a look at these five commonly made mistakes when trying to save money. It’s a common misperception that all savings accounts are the same. You put your money in and it sits there until you need it. Maybe if you’re lucky you pick up a dollar or two in interest. However, there’s much more to a savings account than meets the eye, and you can actually use them to make money. Instead of sticking with the same bank you use for your checking account, make sure to shop around for the best rates. If you’re earning less than 1% on your savings, you’re leaving money on the table. Consider high-yield online savings accounts from companies like Synchrony where you can earn as much as 2.5% APY (annual percentage yield). Shopping sales is a smart way to save, but be sure to avoid the sneaky traps disguised as sales retailers set for consumers. When you see $10 off $50 or $20 off $100 you might be tempted to reach the $100 threshold for the extra savings. Upon closer examination, the percentage discount is the same and you end up spending double what you planned. The same goes for buy-two, get-one offers. If you’re buying more than you planned just to get something free, the deal probably isn’t worth it. Ask yourself at the register if you would buy the item at full price. If the answer is “no”, you clearly don’t need it! If you’ve shopped at a department store or big box retailer recently you’ve surely received their credit card pitch: “Do you want to open a store credit card to save 20% today?” When carefully calculated on major purchases, this can sometimes be a bonus. For most of your everyday purchases it’s best to steer clear. Not only does having numerous credit inquiries damage your credit score, more cards can lead to more temptation to spend and rack up additional debt. Instead, keep your favorite coupon app handy so you can search for sales in-store. Often you’ll be able to find a coupon offering the equivalent discount without having to acquire an additional credit card. You can even earn cash back on purchases by using Swagbucks to double your savings: download their app or add the Swagbutton to your browser so you never miss a deal. There’s no arguing the convenience of Amazon is hard to beat. They have pretty much everything, shipping is almost always free, and some orders even show up the same day. Unfortunately, all of these benefits can lure you into a false sense of savings if Amazon is the only option you consider. They’re one of many online retailers who utilize dynamic pricing. This means they fluctuate their prices throughout the day based on demand. If you’re shopping for something highly coveted, take the time to shop around and compare costs. There are even helpful apps and browser add-ons such as Honey and Invisible Hand that will give you a notification if there’s a lower price available elsewhere. When they day finally comes to buy that big-ticket item you’ve been scrimping and saving for, extended warranty offers can sound awfully tempting. You wouldn’t want that hard-earned money going down the drain should something go wrong. What you may not know is that the manufacturer’s warranty that’s automatically provided is sufficient for most major issues. Additionally, many credit cards extend extra coverage when you use them to make your purchase. With both of these bases covered, it’s safe to say that buying an extended warranty is more expensive than it’s worth. Considering all of this extra coverage, you may be wondering why retailers push warranties so hard. As it turns out, stores pocket a percentage of the cost, making warranties one of their more profitable sales. Here is more on why should steer clear from extended warranties from Consumer Reports.